Clean leather and fabrics inside your vehicles with AutoRight SteamMachine. 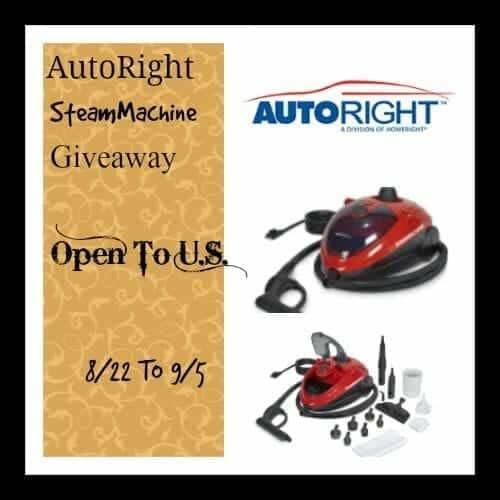 Enter sweepstakes below to win a steam cleaning machine. Hosted By Tammie’s Reviews, Giveaways and More, Co-Hosted By Queen Of Reviews, Michigan Savings and More and Heartbeat~Soul Stains. If you have a car, boat or RV, The question is -How are you going to clean it. It is a common fact that steam cleans and gets rid of 99.9% of germs. Why would you want to clean any of these with anything but a steam machine? What? You say yours is too big? This is why you need to enter this giveaway because the AutoRight SteamMachine was built just for small places. It is much smaller than the others and fits perfect in things like cars, boats and RVs. You can read Tammie’s review and her thoughts on it by going HERE. Disclosure – We are not associated with any of the companies named above. No purchase is necessary to enter. Void where prohibited by law. The odds of winning are based on the number of entries received. Open to the US 18+ only. Confirmed Winner(s) (by Random.org) will be contacted by email. Winner(s) have 24 hours to respond before a new winner is chosen. The sponsor(s) will be responsible for product shipment to winner(s) of this giveaway. My blog is not responsible for product shipment/delivery nor did I receive compensation. Only 1 prize per household. This event is in no way administered, sponsored, or endorsed by, or associated with, Facebook and/or Twitter, Google, Pinterest. This disclosure is done in accordance with the Federal Trade Commission 10 CFR, Part 255 Guides Concerning the Use of Endorsements. Entrants must only enter with either one email address, IP address and/or Facebook account, anyone found violating these rules will be disqualified. It is at the sole discretion of the admin of the giveaway if the winner has met the rules or not. Contact Tammie at [email protected] and see how I can promote/feature your product for you. With regular visits to the car wash. I try to clean out trash immediately, and I look for trashcans in parking lots like at Walmarts. I use car wipes too. I always have a trash bag in the car and once a week will do the basics in cleaning my car inside. The outside gets done as it needs it. i wash the car in the yard and vacuum it too. i do it about once a month when i am on schedule. I’m afraid I don’t do a very good job of keeping the car clean! I try to keep a bag for trash in the car, but most of the time I forget it! We usually just pay someone else to do it.